Spending a Sunday with your motorbike can sometimes mean getting some much-needed cleaning and maintenance done rather than heading out for a blast. Finding the time to give your bike some love can be especially tricky if you use it to commute during the week. Whether you love or loathe this task (I am of the latter persuasion), if you want your bike to shine all summer or survive the grime and salt of winter unscathed, then you need to give it more than just a quick shakedown at the local jet wash.
Infact, if you really want your bike to shine, as well as retain its value, then you need to use a variety of cleaners – and a bit of elbow grease. To help point you in the right direction, below is a definitive 10-step guide to keeping your bike gleaming whatever the time of year. For our guide, we've chosen to use Suzuki's retro SV650X. Prepare to clean your bike by making sure the engine and exhausts are cold; any residual heat will quickly vaporise the water and cleaning compounds, leaving behind a tarnished residue. Place the bike on stands so both wheels are off the ground. Pre-rinse with water using a hose and direct the spray at any large clumps of dirt so it loosens and blasts it off. Thoroughly wet the bike so it is completely soaked. 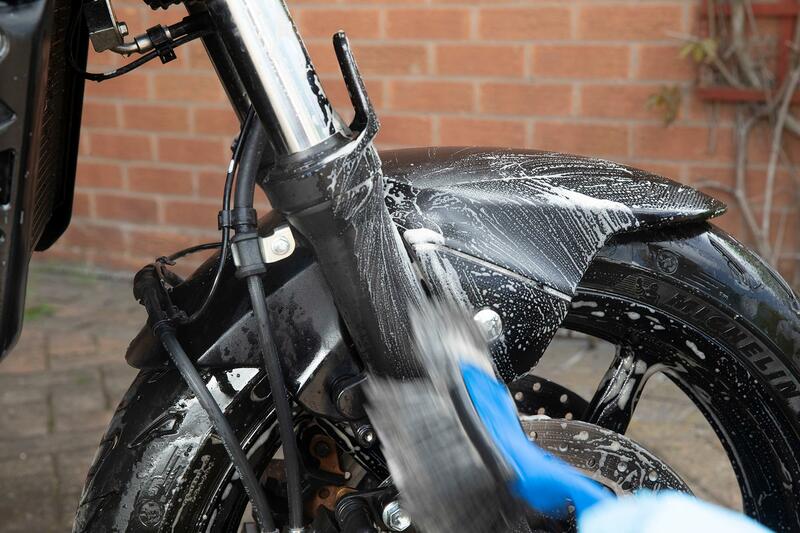 Make sure you use a motorcycle-specific cleaner, and take care not to confuse a cleaning product with a degreaser. As soon as you've sprayed the cleaner onto the bike's moist panels, the solution gets to work, reacting with the water remaining on the bike. Leave the cleaner to dwell for two or three minutes. It may be easier to work on one section of the bike at a time to prevent the cleaner drying out, especially on hot, summer days. Work the cleaner into the chassis parts and engine first. Using a suitable brush, agitate the cleaner lightly. There is no need to scrub aggressively, as this will cause scratching. The cleaning compound will loosen the dirt and make it easy to remove. For areas where there are deep pockets of road dirt, rinse off and reapply cleaner as many times as needed. 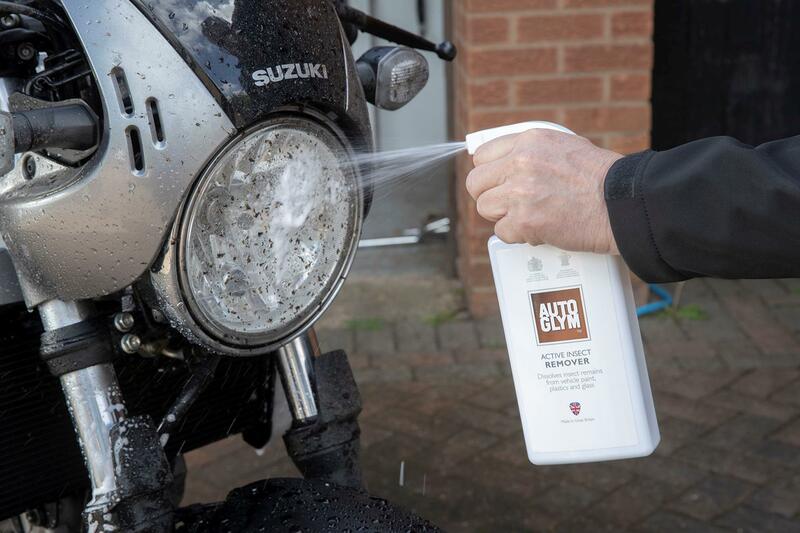 Any baked-on insects, road tar or chain lube can be spot cleaned later, so don’t scrub it now. Insects can be difficult to remove without scrubbing and potentially causing damage - especially to finished surfaces. Use a dedicated cleaner and follow the instructions. This Autoglym Active Insect Remover (around £8.50) is one of the best - just spray it on and leave it to do its thing for 30 seconds, before simply wiping away the encrusted insects. Don't forget to clean away insects from areas such as the front of the forks, handlebar switches and mirrors, too. Rides on hot summer days can see melted tar flung up from the road surface and onto your bike’s panels. A dedicated tar removing solution tends to be a bit more aggressive and is better at shifting some of the complex compounds found in these deposits. 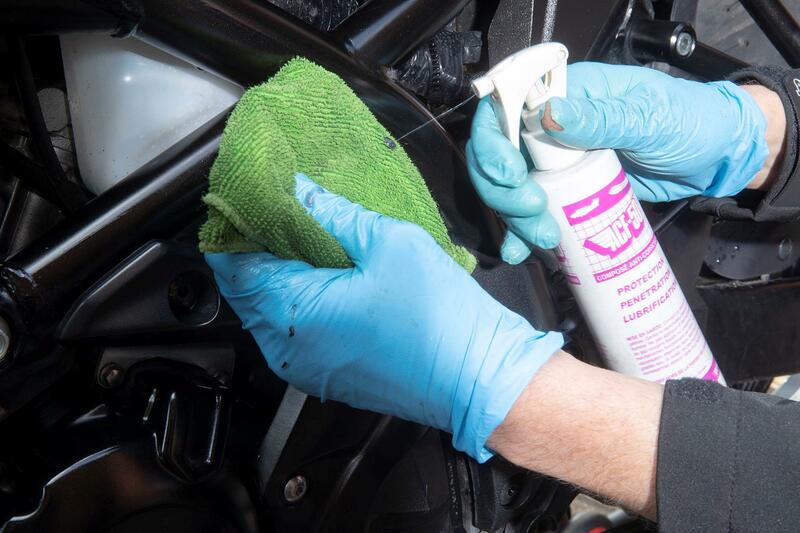 Follow the specific instructions on the label and only use it to spot clean the small areas where tar is typically found, such as on the underside of exhausts, downpipes, engine and fairing lowers. Give the whole bike a thorough rinse with a hose. The idea is to remove all traces of dirt and any remaining cleaning product. Back flush the radiator so that dirt is forced out of the front, or else it will get stuck. During rinsing, occasionally run your fingers over the surface. If it feels even slightly slimy or slick there is still cleaning product left on - aim for a ‘squeaky’ clean feel. 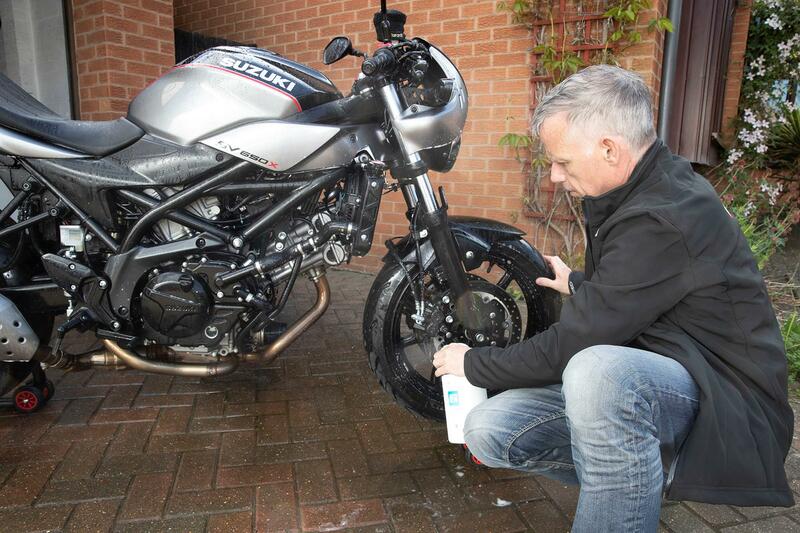 When the bike is rinsed off, check around the back wheel and side panels for chain lube fling. Often, a normal cleaning agent isn't strong enough, however SDoc100 chain cleaner is a big MCN favourite. There are several dedicated cleaners to do this specific job and their strong degreasing properties easily remove chain lube that has embedded itself onto surfaces. Use it sparingly and only for chain lube removal. 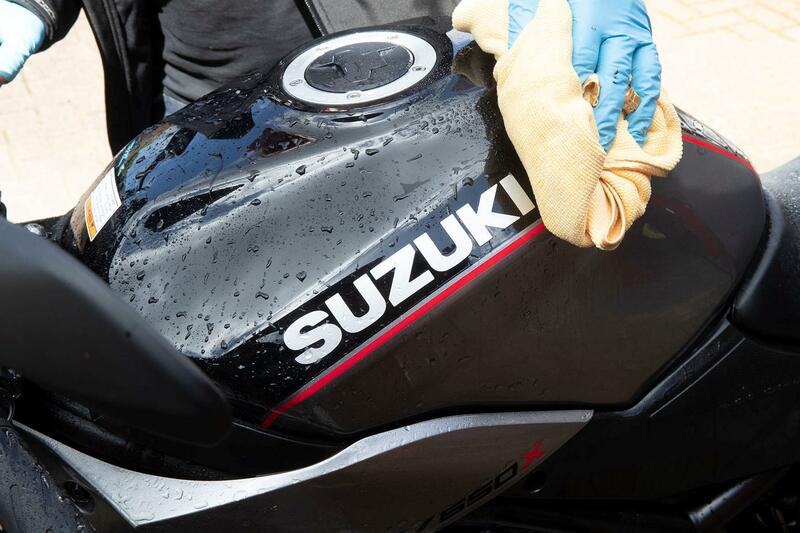 Dry the bike off with a good quality drying cloth, working your way down the bike and turning the cloth as you go. Wring out as necessary. Make sure there are no hidden pools of water lurking in any crevices, for example under the fuel filler cap, as these could lead to watermarks and corrosion. If you have one, an airline is good for blasting out the water from these areas. Apply polish as per the instructions. Take care not to apply it directly on top of raised or embossed lettering, bolts or trim, as this will cause the wax to leave white deposits on the edges and can be unsightly. Apply the polish with a separate cloth or specific applicator. Let it dry to a dull haze and then buff off with a specific polishing cloth, turn the cloth as necessary to maintain a clean polishing area. Tarnished plastic trim can be treated with ACF-50. Apply ACF to a cloth and rub it on, using another cloth to remove and buff the area afterwards. The same goes for metal surfaces. You can apply it to many parts, such as wheels, chain adjusters and sprocket carriers. Always remember to apply it sparingly and not direct from the can. It's good practice to use this final part of the process to visually check over the whole bike for safety. Clean your bike without water! How should I clean my chain? We have reached that time of year when you can't always rely on the weather when you go riding. How should a motorbike helmet fit?